I love music, all types from many different genres. If you want to hear a funny story about me an how I hear music in everyday life, check out Blessing or Curse. You want to get to know me other than just as your entertainer? Check out my personal facebook page and friend me. This way I will be able to tag you in the pictures I take at your event! While I love to entertain in general, I would have to admit that one of my favorite show types is Car/Truck Shows and Motorcycle Rallies. When I have a free weekend or evening, I love wrenching on my toys or hanging out at shows and rallies, meeting other folks who feel the same way. I also have a strong love for mixing. Especially in the winter months, you can find me in my studio playing with remixes and medleys. I love manipulating sound. 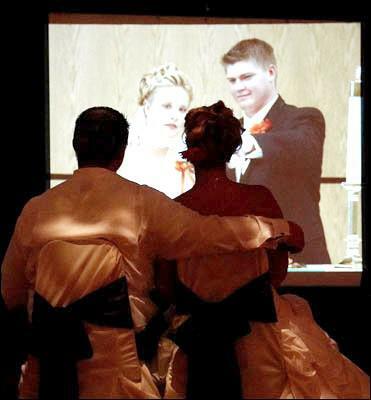 I even do custom mixes for drill teams and some special first dances. Check out my remixes page. I got my start when I attended college at the University of Arkansas in Fayetteville. A humble start it was -- armed with a small Radio Shack mixer and home stereo equipment; I began playing Greek functions and hall parties in 1987. After graduating with a Marketing degree in 1991, I accepted a sales position with a major poultry company (Perdue Farms) in Salisbury, Maryland. There, I teamed up with another young DJ and began playing gigs up and down the east coast. During the summer months, the majority of these shows were at clubs and pubs between Rehobeth Beach, Delaware and Ocean City, Maryland like Smitty McGee's and The Greene Turtle. The rest of the performances were smaller private functions like wedding receptions and school dances. These shows included mostly music. I credit much of my success today to my early experiences playing at the clubs and pubs at the beach. The crowds in these venues were as diverse as can be imagined. One night might be a large tourist group from New York City consisting of people of ages from 30 to 60, the next night might be all college kids in their early 20s, and the next night might be middle aged families with kids. Not only was I required to have a large library consisting of music from many eras, but also, I dealt first hand with all types of patrons. I moved back to my college town of Fayetteville, Arkansas, in 1996. There I built a new sound system and continued to perfect my craft, playing receptions and school dances. In 1997, I added lighting and special effects. These included par cans, a variety of lights from American DJ, Chauvet and Martin and special effects like fog and bubbles. I was also starting to get requests for Karaoke; so, in the following year, I added karaoke which meant 2 TVs, 3 additional microphones, song books and karaoke discs. I was still using CDs as the media; so, I had a large library to take to each function. I had about 1900 CDs that were music, and about 250 that were karaoke. 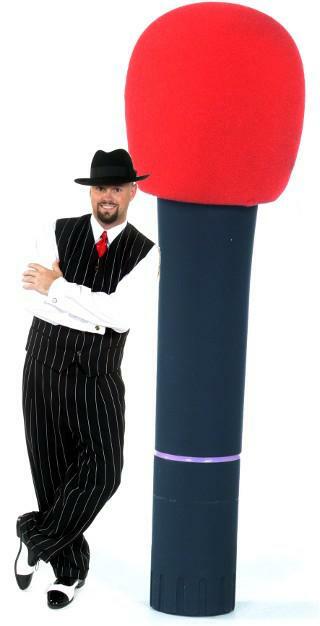 I consider myself more of a dance DJ than a KJ (karaoke DJ). In 1998, I made another move - back to my hometown area of Fort Smith Arkansas. By this time, I had compiled one of the largest special effects packages in the region. My impact on the area was immediate. Not only did I continue to play private functions, but I also began making cameo appearances at clubs like Beethoven's (in the Holiday Inn), the 5th Seasons, 57 Chevys, Ocean Club and Silks in Sallisaw Oklahoma. For 2 years, I became the resident DJ at Beethoven's. The club was open Thursday through Saturday and some holidays. In this role, I was responsible for ensuring that the club had talent in booth whenever we were open. I hired a few DJs who were on call. They, like me, had other jobs too. I was there, behind the mic, the majority of the time; but when I had a gig, I would schedule one of the other DJs to stand in. I was the boss, but we all were good friends and worked well together. Being at Beethoven's also put me on the radio. We ran a marketing promotion for almost a year on a local station - MIX96. Our show was a live 2 hour broadcast to help bring in new customers. The Friday Night Dance Show was on the airwaves from 9:00pm to 11:00pm and it was wildly successful! The first night we were live on air, we had 4 executives from the station standing behind the booth. First, they wanted to review and approve all songs before they were used. I explained that I had over 15,000 songs, not counting the songs I had remixed, and that this would take way too long. I went on to explain that I understood the restrictions and that I would work within those parameters; but it was obvious that they had no trust in me. We finally went live and I started doing my thing with the 4 execs and my Manager - Becky Bush - looking over my shoulder. I was talking and interacting with both our crowd and with the listeners that I knew were out there. I was cutting up, but most importantly, I was jamming. Back in the day, I subscribed to a music service called Radioactive that would send me CDs weekly containing new music that had not yet hit the top 40 on the radio. This allowed me to preview the songs and drop tunes that I liked, before they were popular, and mix them in with old favorites. I played mixed sets with vinyl and CDs that were a combination of new and old songs. I played old standards as well as remixes I had made. The crowds grew and so did my popularity. I loved the notoriety, but for me, it was always about the music. I loved having the ability to introduce people to music both new and old. I loved being able to pull the crowd out onto the floor through the music I was playing. I could get them out with a trusted anthem and then mix in something that worked from another genre. Afterwards, I would have people approach the booth and ask, "What was that?" I would educate them on the particular song and why I liked it. Eventually, some of those favorite tunes got requests and became staples. It was a cool cycle. I enjoyed sharing my tastes with my crowds. I have fond memories from those years as a resident jock and being on the radio. 2005 brought another opportunity. I had a buddy, "BIG CHIEF", who was managing the Electric Cowboy, also in Fort Smith. I met him when I played in Sallisaw at Silks Lounge which was right beside the horse track: Blue Ribbon Downs. He wanted to increase attendance on Thursday nights; so we collaborated and decided to have a Thursday Night Dance Party. Even though the Electric Cowboy was known as a country venue, for about a year we had a regular Thursday night dance party. The regulars enjoyed the variety and it pulled in a new group of patrons. The main theme was the 90s era, but I also mixed in trash disco and a few new cuts. So, I want to share an interesting ability I have acquired as an entertainer. I am not sure whether it is a blessing or a curse -- I DJed in clubs and at weddings so long that I have developed a talent (although affliction might better describe it!). I have patrons come to the DJ booth maybe intoxicated or maybe just a little goofy. They say, "Hey, can you play that song, you know…," then half hum and half speak 4 or 5 words, and I can come up with their song. Now in everyday life, I am in a conversation and people say a word or a phrase and I hear it as a lyric. Once, I was driving my mom from Alma to Fayetteville to watch a Razorback basketball game. She doubted how bad my situation was; so, I agreed to tell her every time I heard a different lyric on our hour drive. The number was in the high 20s. You can imagine, it gets a little weird sometimes! Although I had become quite a fixture in the Fort Smith area, I never lost my love for the people in Fayetteville. I loved the bar scene, but the money was in private functions. I could make more in 1 private event than I would in 4 or 5 nights spinning in a bar. With the opening of the new road (HWY I49), I played about as many shows up in Northwest Arkansas as I did in my hometown of Fort Smith. I was at a bridal fair in NWA and met RoAnna McDaniel who was then the Banquet Coordinator for the Crescent Hotel in Eureka Springs, Arkansas. She and the other Eureka Springs venues were struggling to find quality entertainers to travel to their town. The thought of a 2 hour commute to do a show seemed silly, but she talked me into giving it a shot. 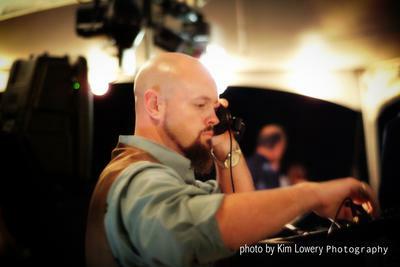 In no time, I found that I was getting lots of calls by out-of-towners to play in Eureka Springs. The Crescent Hotel, Basin Park Hotel, and Best Western Inn of The Ozarks, all in Eureka Springs quickly became a large portion of my business. Many people travel to the world renowned Thorncrown Chapel to get married each year. They travel to Eureka Springs and bring friends and family for the ceremony. They then needed an entertainer for the reception. I had to raise my rates to justify the travel time, but since they were from major metropolitan areas like Dallas, Memphis, New Orleans, Denver, etc. the rate was not an issue. This crowd was a natural fit because it was very similar to groups I encountered during my performances back on the Eastern Shores of Delaware and Maryland. These groups were very diverse in age, ethnicity and where they were from. Eureka gets guests from all over the United States. I played polkas for the Midwesterners, Zydeco for the Louisianans, 10-steps for the Texans and everything in between. 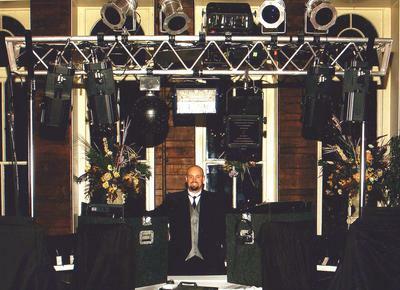 It was around this time that I also started doing sound and lighting installations. I have always wanted to own and run my own club, so this was the next best thing. I was hired to plan, create and install lighting and sound systems. 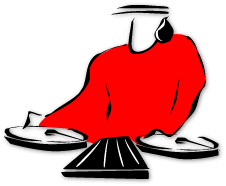 I had a hand in the original install or updating equipment in such places as Shooters Pool Hall, Midland Bowl, Area 51, Silks Nightclub, '57 Chevys and several churches and homes. Each install required creativity to get the right look and sound for that venue. In 2007, I moved back to Fayetteville. I had found that the majority of my shows were in Northwest Arkansas and Eureka Springs and the decreased driving time was welcomed. Being a University of Arkansas alum, I have always been a huge Razorback supporter and loved the area so it was a seamless transition. 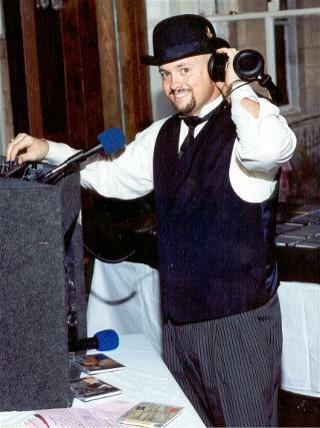 My shows in NWA now consisted mainly of Weddings, Car and Motorcycle Rallies and Shows, Corporate Christmas Parties, Fraternity Parties and School Dances and Proms. I still do the occasional club gig, but not as many as I used to. I am a consummate professional. I love what I do and I am always striving for perfection and looking for ways to improve my shows through the music. While Music in Motion is definitely a business, I purposely restrict my number of annual performances to an average of between 50 and 60 a year. This keeps me fresh and always anxiously anticipating my upcoming performances. With the ever changing technology, there were other ways to achieve similar results as spinning vinyl with CDs. In 1998, I added the Denon Digi-Scratch Mixer. This allowed me to take a main stream dance song on CD, like "Men in Black," "Mumbo #5," "Push It," etc., and create a new sound. I was still using CDs, but I could manipulate it, just like it was vinyl. I am old school and I like to touch the media and be hands on; I like to feel the buttons and knobs as I am creating the new sound. I am also visual, to this day, I remember what songs were on which compilation disc and where it was in my collection. Eventually, I made the move to being totally digital. I admit that this move was the hardest, but I am now loving the digital era. I use a platform called Virtual DJ for most of my gigs. I have Serato which is also very popular in the club scene, but I prefer VDJ. I have a few different midi players that I use for different occasions. In layman's terms: the music, video and karaoke files are all in digital files that are played through whichever program I choose on my laptop. I use the midi player, which has the feel of a mixer and mini turntables to actually perform and manipulate the digital music files. The midi player syncs up with the digital program so whatever I do on the player translates and does the same thing in the program to the music. I still beatmix and remix all the time. This is one of the things that I really enjoy and that sets my shows apart from many other jocks. With the internet and TV Shows featuring music and DJS, I think my audiences are much more informed and even more demanding. At my shows, regardless of how simple or small, I never just play songs - I MIX MUSIC!! Some of the remixes are live, some are things I have done in my studio and copied, but they are included. The overall song, tempo, and lyrics remain the same, but the bass line and feel of the song is much different - I hope people think improved. You can hear some of this on my Remixes Page. My dance crowds love it! After so many years with my ear in a headphone, I hear the old songs that were used to create the new ones. Artists like Eminem, Will Smith, even Bruno Mars use samples from the old tunes to create the new stuff you hear today. I love to mix the old songs back into the new ones. I have had parents at Proms and school dances hear my mixes of the old and new mashed together; then come up and say "I knew I had heard that somewhere". It is fun to bring them into mix and I feel sure there are conversations between parents and their children on the ride home discussing what I have done. In some ways, I think it helps bridge the generational gap and I am humbled to be able to play a hand in that. I am generation X and the group before me are the baby boomers. Generation Y and Z and Millennials have a ton of different types of music that they like. They have everything from EDM (Electronic Dance Music), Art Punk, dubstep, Goth Rock and many, many more. This doesn't even address music in different ethnicities like Hispanic and European tunes. A good DJ and make them all work together. The groom was Hispanic and the bride was Chinese. I don't speak Spanish, but I wanted to include his group so I got him to send me a list of his 30 favorites. I had him break them down as: old favs, slow, new hits, etc. I bought the ones he suggested and spent hours listening. Of course, I couldn't understand any of the lyrics, but it all goes back to the music: rhythm, tempo, beat, etc. I made myself notes for each song and even created cue points to use and practiced mixing them into some of the new songs. At the event, I mixed them in the sets as if I knew them and made them a big part of the show. You know how sometimes you know you are being talked about? Well, after the night was over, I began tearing down my set. I noticed 4 guys - Hispanic, that were watching me, talking and kind of laughing. I thought they were making fun in some way; so, I approached the group, introduced myself and attempted to ask what the conversation was about. They were friendly, but with the language barrier could not explain it to me. I found the groom and asked if he would help explain what they were trying to tell me. After a brief exchange, he started laughing too, which frustrated me further. He then explained that they were his buddies; one of which was a DJ at a local discotheque that they all like to go to. 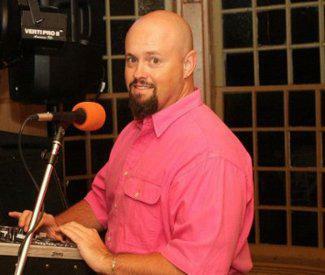 Some of the songs that he, the groom, recommended were ones that he had heard his buddy play at the club. Anyway, the 3 guys were actually giving their DJ buddy a hard time, not me. They were saying that I mixed the Latin music better than he did and I didn't even know the words. It all goes back to "It's just music". Some I like and some I don't, but my shows are all about my clients. To do my job, I have to be able to play what they like and this means being versatile and creative. If you look hard enough, no matter how far off the beaten path some genres seem to be, they have an origin or some path that leads back to something recognizable and familiar. I love it when I am booked to play a show that will include music that I am unfamiliar with: it gives me a chance to learn new music. My music library is wide-ranging and I always bring a full bag of tricks to try spice up and personalize every event I play for and make it unforgettable. 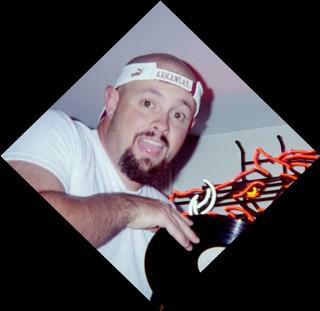 I was a regular at DJ/KJ conventions in Las Vegas NV, Knoxville TN, Atlantic City NJ and Atlanta GA, and I still attend an occasional DJ convention, where I focus on networking with other entertainers. I love interacting with other entertainers (young and old) from all over the country and even the world. I think the second you think you are too good to learn, you get old and start losing it! I love the opportunity to get to talk to other entertainers and see how they take on the business and learn how they handle certain situations and some of their mixing techniques. 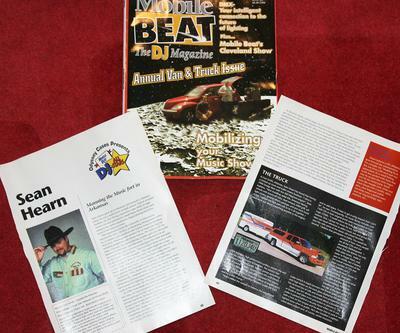 In the 2000 November edition of Mobile Beat Magazine, an international publication devoted to DJs and Entertainers, I was given the distinction of Odyssey Case All-Star. Back then, this honor was given to a few DJs annually who the magazine felt were at the top of their game. Mobile Beat considered the entertainers' abilities, equipment, and overall customer satisfaction. I was honored to have been included. My first visit to Arvest Ball Park in Springdale was as a member of the NWA MSBL (Northwest Arkansas Men's Senior Baseball League). I was a catcher for a few squads in the league over the years. We won the championship one year, but we never returned to the championship game. 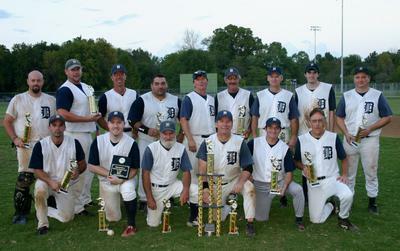 Eventually, the MSBL partnered with Arvest Ball Park and started having the championship game there at the stadium. They would allow me access to the booth; so, I became the PA guy. I would set up my laptop, announce the game and play all of the music drops. 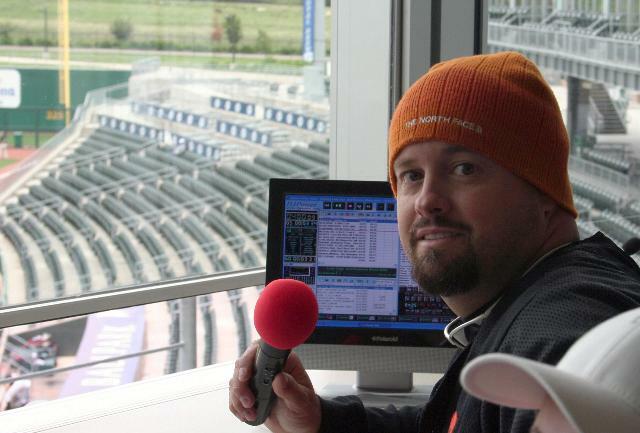 In 2015, I joined the Naturals Baseball Pressbox Team as one of their Public Address Announcers. I have always been a huge baseball fan; so this was quite fun for me. I was able to enjoy the games but also work in an entertainment role. As a PA guy, I announced all of the batters coming to the plate, and spoke live advertisements for the team's sponsors. Being in the booth, I also gave some advice on drops and snippets of songs that could be used to add humor for certain situations like pitching changes, strikeouts, homeruns, etc.